And here I cannot pass over one circumstance which always floats in my grateful memory. The day after my arrival in the capital, my master took me into the Italian church to offer there my devotions. As we were going home he said to me, "I thought it my duty to begin your musical education with God. Now it will depend upon you whether its results shall be good or bad. I shall at all events have done my duty." Right after his arrival in Vienna Salieri began intensive studies under Gassmann's supervision. An Italian priest gave him lessons in Latin and Italian poetry and he also studied German and French. A musician gave Salieri lessons in basso continuo playing, score reading and violin, and Gassmann himself tought Salieri counterpoint based on Fux's Gradus ad Parnassum. 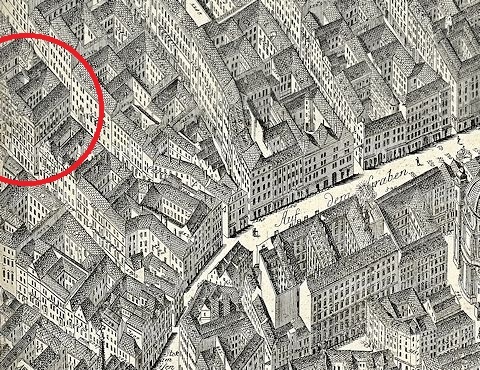 Since I like to answer questions that nobody has ever posed, I tried to figure out where Salieri lived in Vienna between his arrival and his marriage. This task is easier than it seems, because until Gassmann's death Salieri always lived with his teacher. To follow Salieri's traces during his early years in Vienna, therefore amounts to research on Gassmann's life and residences at that time. The earliest of his Viennese addresses that Salieri remembers is "an old house by the so-called Wasserkunstbastey before whose windows lay a marvellous view of the widespread suburbs." The Wasserkunstbastei was a part of the southern city walls between the old Kärntnertor and the Stubentor. The exact house overlooking the Wasserkunstbastei where Gassmann and Salieri lived cannot be identified. 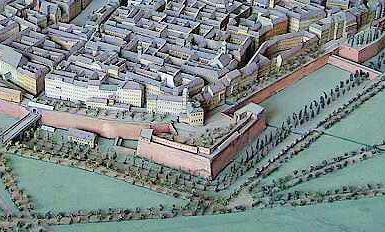 The Wasserkunstbastei between the new and the old Kärntnertor (on the left) and the Stubentor (on the right) on Carl Wenzel Zajicek's panorama of Vienna's fortification. Right behind the center bastion is the tower of the Kolowrat-Liebsteinsky palace. The same area on the model of old Vienna at the Wienmuseum. 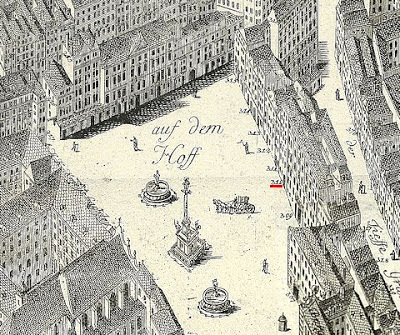 At the time of Gassmann's marriage in 1768, he and Salieri had moved to the suburb of Josephstadt, into the house "Zur goldenen Säule" ("At the Golden Column", today Josefsgasse 8). Their landlord was the upholsterer Nicolaus Heurteur. 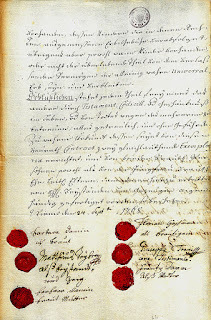 This move was related to Gassmann's father-in-law having lived in the Josephstadt for at least thirty years. On 22 September 1768 Gassmann married Barbara Dam, daughter of Franz Dam, an I. & R. hosier. On the right Salieri's and Gassmann's 1768/69 residence, the house Josephstadt 52 "Zur goldenen Säule". This house was built in 1708 and torn down in 1910. In the background the house Josephstadt 64 "Zum grünen Strauß" (today Lange Gasse 10, torn down in 1903) where in 1749 Gassmann's wife was born. On the left is the Palais Auersperg. præstito utriuß / iuramento Cop. [ulavi] / P. Lambertus / 22 Sept. 768. / 103. Der HochgeEhrte H[err] Florianus Gaißmann Kaÿ[serlicher] Com- / positor L.[edigen] St.[andes] auß Böhmen von Brix gebürtig, wohnhaft / in der Joseph Stadt beÿ der goldenen Säulen, des H. / Johann Gaißmann eines Bürgl. Goldschmid, und Evæ / beeden seel. [ig] ehelicher Sohn: nimmt Zur Ehe die E.[hrn-] und T.[ugendreiche] / Jgfr. Barbara Dämin von hier gebürtig, wohnhaft in / Kaÿl. 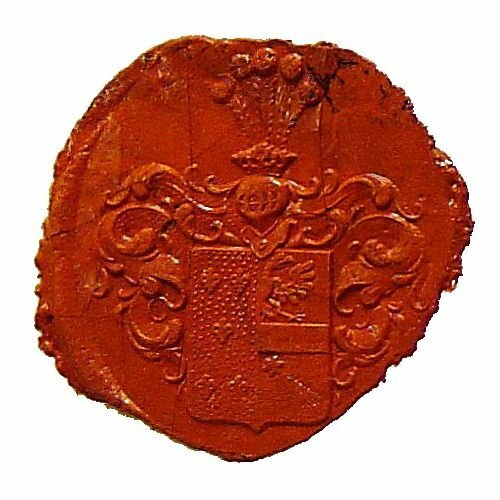 Äschernäl des H. Franz Däm eines Kaÿl. Musici / Hof-Strumpf-Würkers, und Barbaræ beeder noch im / Leben eheliche Tochter. Sponsa Semper in Parochia. dispensati copulantur / præstito utriuß iuramento. Testes: H. Joseph Tränni Hof-Musicus. Barbara Dam lived at the imperial armory, im Elend 346. The court violinists Joseph Trani and Matthäus Teyber officiated as witnesses. The "resigned predicate of nobility" assigned to Dam in the literature is pure fiction. The child's godfather, the wealthy court jeweller Franz Michael von Smitmer (1701-1782), signifies Gassmann's generally excellent social connections to members of the Viennese upper-class. 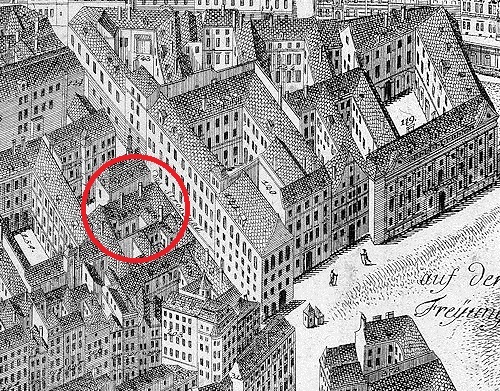 The Gassmann family and Salieri now moved back to the city to the "Schmidisches Haus" on the Mölkerbastei where Gassmann's son Franz died of "Zahnfraß" (toothing cramps) on 15 August 1770. The "Schmidisches Haus" No. 88 (named after its former owner, the canvas trader Matthäus Schmid), together with the "Marinonisches Haus", was one of the two predecessor buildings of the "Pasqualatihaus" (built in 1797) which today is the only extant residence of Beethoven in the inner city. 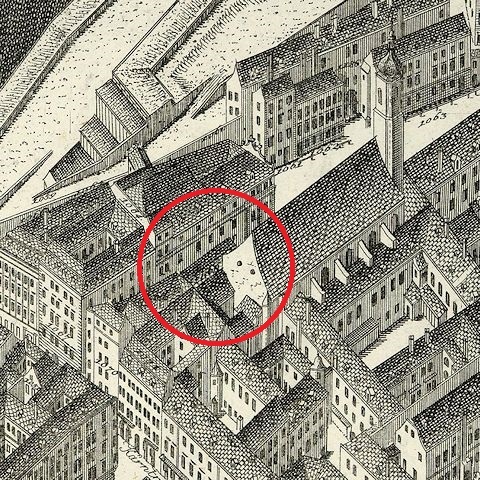 Salieri's residence in 1770: the "Schmidisches Haus" No. 88 on the Mölkerbastei. Court payment records from 1772 (unearthed by John Rice) show that at that time Gassmann and Salieri lived in the "neues Häusel an der Bürger Spittal Kirche" ("the new house beside the church of the civic hospital"). This building was located in the so-called Komödiengassel, east of the church St. Clara opposite the Kärntnertortheater. The area between the Wasserkunstbastei (upper left) and the Bürgerspitalskirche and the Kärntnertortheater (the orange colored "Comedihaus" at the upper right) on the 1710 Steinhausen map. The small garden left of the church marks the future location of Stadt 1068, the "neues Häusel an der Bürger Spittal Kirche". The vertical street is the Kärntnerstraße (A-Wsa, Kartographische Sammlung, Akt 3.2.1.1.P1.234). 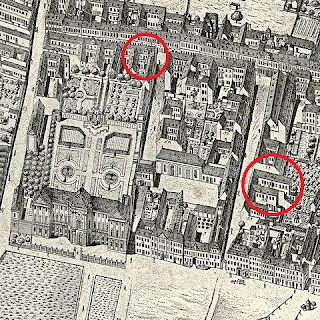 Gassmann's and Salieri's residence in 1772: the house Stadt 1068 beside the Bürgerspitalkirche. In this house Gassmann's first daughter Anna Barbara (whose name and year of birth are given incorrectly in New Grove, MGG and the Österreichisches Musiklexikon) was born on 23 July 1772. Her godfather was Gassmann's Venetian patron Leonardo Venier whom (based on Joseph Sonnleithner's 1795 Theater-Almanach) The New Grove misnames "Count Leonardo Veneri". Venier was substituted at the baptism by the court physician Dr. Joseph Quarin. After her father's death Anna Barbara Gassmann was to receive singing lessons from Salieri (paid for by the court) and, like her younger sister, became a "k.k. Hofsängerin" of repute. On 3 October 1816 (A-Wd, Tom. 83b, fol. 331) Barbara Gassmann married the court violinist Peter Fuchs (1753-1831). Her "second father" Salieri of course signed her marriage contract as witness. 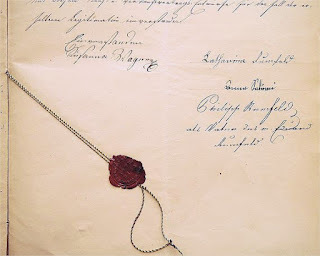 Anna Gassmann's and Salieri's seals and signatures on Peter Fuchs's 1816 marriage contract. Peter Fuchs,who was born on 22 January 1753 in Vienna (St. Ulrich, Tom 27, fol. 288r) (and not in Bohemia, as claimed by the notoriously flawed Österreichisches Musiklexikon), son of a mason from Passau, was one of the leading Austrian violin virtuosos of his time. 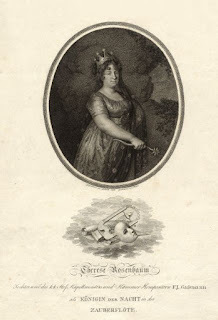 His first wife had been Johanna Gsur, daughter of Tobias Gsur (1725-1794), who in 1774 had unsuccessfully applied for Gassmann's post as Hofkapellmeister (A-Wsa, Mag. ZG, A10, 369/1831). According to Joseph Sonnleithner's biographical sketch, Florian Gassmann died of long-term effects of a carriage accident he had suffered during one of his stays in Italy. Gassmann seems to have broken two ribs that punctured his lung and caused fluid to accumulate in the pleural cavity. The cause of death given in the records is "Brustwassersucht" (hydrothorax). The date of Gassmann's death given in the literature is generally wrong and inconsistent. In her article in the MGG encyclopedia, Andrea Harrandt even manages to provide two different dates of Gassmann's death, both of which are false. 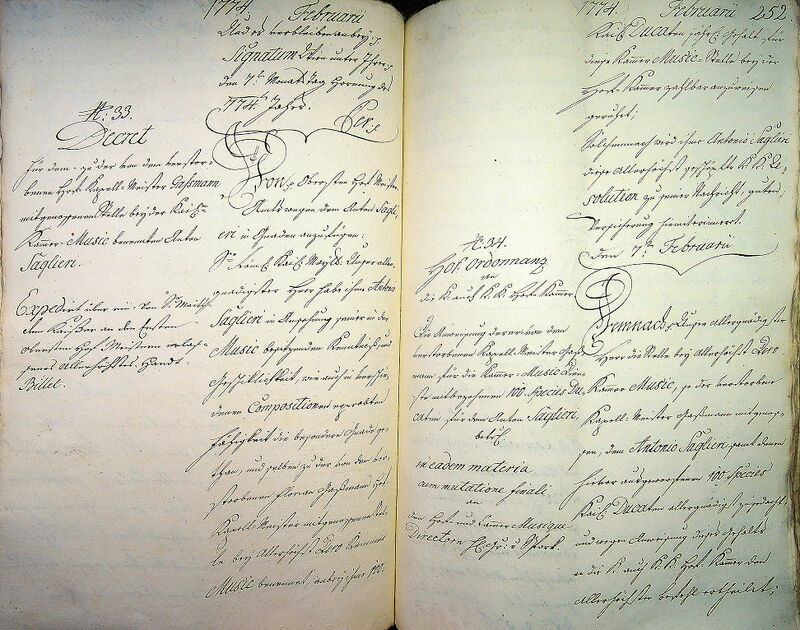 The entry concerning Florian Gassmann's death in the municipal death register (A-Wsa, TBP 68, fol. 6r). The initials "A: H:" at the end of the entry refer to the municipal coroner Anton Hochmayr. Gassmann died on 21 January 1774 (the date given by Pohl is also wrong), at 10 p.m., in the house of Count Kraft Ernst von Oettingen-Wallerstein (1748-1802), at Stadt No. 206 (today's building dating from 1852 at Strauchgasse 3). Gassmann was buried on 23 January at 4 p.m. in the "Montserrater Gottesacker", a cemetery on the Alsergrund. His lavish burial cost 150 fl 25 x. We don't know if Salieri continued living in the household of Gassmann's widow. On 1 April 1774 Barbara Gassmann gave birth to a filia posthuma ("Pater Florianus Leopoldus Gäßman K:K: Kapellmeister . jam defunctus.") who was christened Maria Theresia Josepha, and whose godmother – out of pity for the widow – was Empress Maria Theresia (substituted by her chambermaid Theresia Kögler). Therese Gassmann's baptismal entry (A-Ws, Tom. 38, fol. 108v). The claim that Theresia Gassmann was a godchild of Haydn, presented by Karl Geiringer in his book Haydn: A Creative Life in Music, is false. Because the information given in the baptismal records is inconclusive, Therese Gassmann's place of birth cannot be identified. The address "am Salzgrueß N. 307" cannot be correct, because 307 marked the municipal office building of the Unterkammeramt which was not located on the Salzgries, but am Hof. Therese Gassmann was to become a prominent high coloratura soprano who regularly performed at the two cour theaters. In 1797 she was soloist for the première of Haydn's Die Sieben letzen Worte unseres Erlösers am Kreuze and in 1801 she sang the Queen of the Night at the first production of Die Zauberflöte at the Kärntnertortheater. 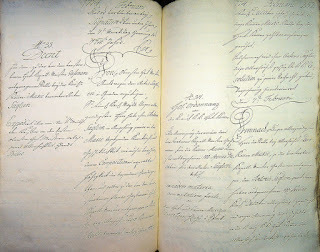 On 11 June 1800, at 6 a.m., Therese Gassmann married Joseph Carl Rosenbaum (1770-1829), a secretary to Count Carl von Esterházy (Harrandt's claim in MGG that Rosenbaum was a secretary of a "Prinz Esterházy" is nonsense). Of course, Gassmann's "second father", guardian and singing teacher Salieri served as her bridesman. 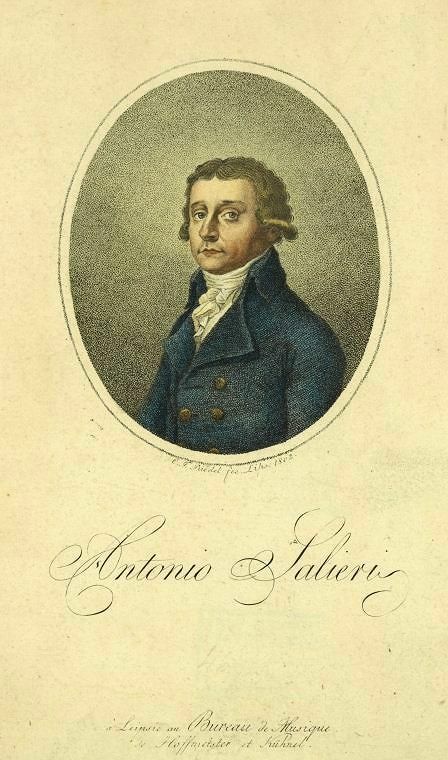 On 7 February 1774, "in recognition of his proficiency and skill in music and his accomplishments in various compositions", Salieri was given a post with the I. & R. chamber ensemble that Gassmann had held and which was endowed with an annual salary of 100 ducats. Soon after this appointment to Kammer-Kompositor Salieri must have moved into the "Heiligengeist Haus" No. 316 at the Heidenschuß, a building I have dealt with in a recent post on this blog about Lorenzo Da Ponte. Volkmar Braunbehrens's claim in his biography of Salieri (Munich 1989) that in 1774 Gassmann[!] and Salieri lived together "auf dem Heidenschuß 361[sic] (= Strauchgasse 21)", is false. When did Salieri get married? To get a definite and reliable answer to this question from the Salieri literature is surprisingly difficult and the reasons for this are twofold: a) Salieri himself slightly misremembered the exact chronology of events, and b) all his modern biographers refer to a primary source that they were unable to interpret correctly. This led to all kinds of misunderstandings and resulted in an amazingly contradictory jumble. In his memoirs Salieri clearly states that the courtship of his future wife Therese Helferstorfer and his efforts of gaining the approval of her guardian began in 1775. In the course of this year I became acquainted with that angel whom God had appointed for my wife. In the year 1775, I gave music lessons to a young Countess who was receiving her education in the nunnery of St. Laurenz, and whom I had instructed before she went thither, at her father's house. In the same cloister other girls, mostly motherless, were boarded. My hour was from 11 a.m. to 12 p.m., and before it was finished these girls, accompanied by their guardians usually passed through the music room to the dining hall. On the very first day of my lessons, one of these girls of slender figure, somewhat taller than the others, about eighteen years old and dressed in rose-colored taffeta, made a mighty impression upon me. Eighth, I appoint my three children, Maria Theresia, Engelbert, and Johann Baptist universal heirs. Since they are not yet of legal age, however, I ask the most honorable authority to appoint Mr. Leopold Hofmann, Kapellmeister at St. Stephen's, in whom I put my special trust, guardian of my children. At the same time I ask Mr. Hofmann to fatherly take care of my children. 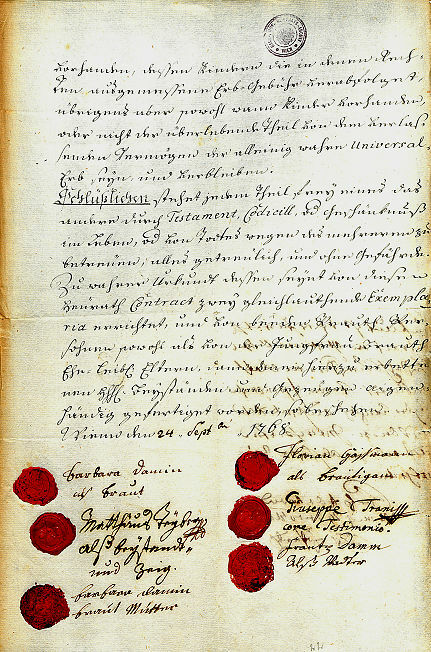 The final page of Carl Helferstorfer' will which on 19 January 1774 was signed in his stead by Leopold Hofmann (A-Whh, OMaA 641-18). The second witness was the paralegal Carl Sebastian Gürsching (1733-1817). However, it was not destined that I should seek my beloved at the hands of her father; that very week God suddenly called frorn this world the worthy old gentleman, beloved by everybody, who had for some time been ailing. [...] Herr von Helfersdorfer had appointed an excellent and rather wealthy man to be guardian of his daughter and two sons, who, a widower of middle age and ignorant of what had passed between his beautiful ward and me had forrned the plan of rnarrying her and soon after the father's death disclosed it to her. Of course there was nothing for Therese to do but declare the state of her feelings and the object of them. As soon as this came to my knowledge, I hastened to the guardian, accompanied by a man of high respectability, and made formal application for the hand of my charmer. 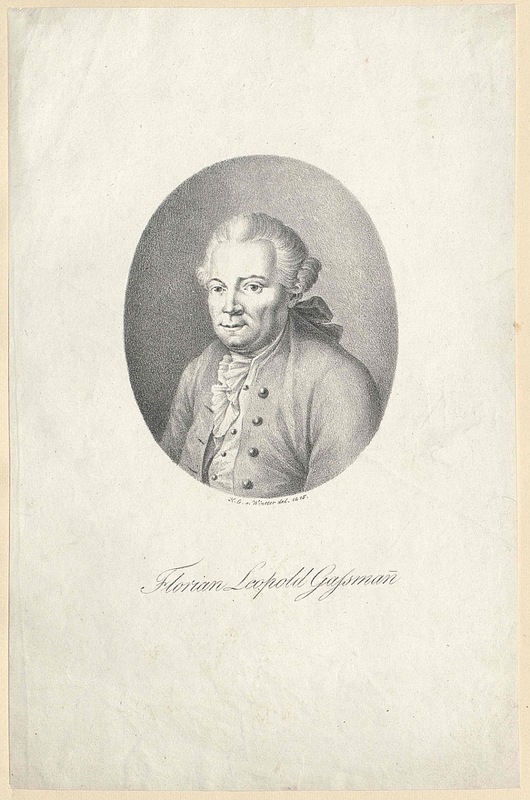 Therese Helferstorfer's guardian Leopold Hofmann, at that time, was also one of the (eventually unsuccessful) applicants for Gassmann's post as Court Kapellmeister. Since the death of his first wife Maria Theresia, née Mayer on 22 October 1772 Hofmann had indeed been a widower, but he soon consoled himself with Anna Kiermayr. daughter of a wealthy goldsmith, whom he married on 2 May 1774 (A-Wd, Tom. 68, fol. 143r. Anna Kiermayr was a grand aunt of Franz von Schober). The "man of high respectability", who accompanied Salieri, was, in my opinion, the renowned physician Dr. med. et phil. Leopold Auenbrugger whose acquaintance Salieri had made when he gave music lessons to Auenbrugger's daughters. In his article "Antonio Salieris vergessene Familie" (Festschrift Max Schneider, Leipzig, 1955) Robert Haas published Salieri's marriage contract which is dated 10 October 1774. What date for Salieri's wedding do we find in the literature? Wikipedia (as of March 2013) gives 1774 and so does Edward Elmgren Swenson in his 1975 Documentary Biography of Salieri ("On October 10, 1774, Salieri married Theresa Helfersdorfer and moved into her house."). Rudolph Angermüller actually manages to present three different dates for Salieri's wedding. In the third volume of his book Antonio Salieri. Leben und seine weltlichen Werke (Munich, 1971-74) he adds an additional and uncommented "1775" in brackets to the date on the document. And in vol. 1 of his three-volume collection of documents Antonio Salieri Dokumente seines Lebens (Bad Honnef, 2000) he again presents this contract with the aforementioned date, only to claim four pages later – for quite inexplicable reasons – that Salieri married Therese Helferstorfer on 21[!] October 1774. Volkmar Braunbehrens prefers the year 1774 on the grounds of "rather trusting the Viennese chancery clerks than the ageing Salieri". Of course this reasoning makes no sense at all, since eighteenth-century marriage contracts were not written by chancery clerks. In his 2006 article about Salieri's family in Archiv für Familiengeschichte Josef Heinzelmann attributes the contradiction to "a typo in Haas's article". 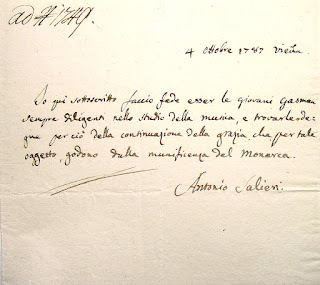 John Rice, who of course noticed the inconsistency between the date on the contract and Salieri's own account, writes in his book about Salieri: "According to the wedding contract Antonio married Therese on 10 October 1774. But Mosel, quoting Salieri placed his courtship and marriage in the following year, 1775. How can we explain Salieri's apparent misdating of these crucial events? A simple laps of memory is possible; or did he feel uneasy that his courtship and marriage had taken place so close to the time of Gassmann's death?" The explanation for this confusion is rather simple: Salieri got married on 10 October 1775 and the date on his marriage contract is wrong. It is easy to see that the date is written in a different, Italian hand and has obviously been added at some later time. It is the hand of Salieri who after the death of his wife in 1807, when he had to submit the contract to the civil court of the Vienna Magistrate to claim his right to the inheritance, realized that the document was still undated, misremembered and wrote a wrong year on the contract. After all, 1774 had marked a turning point in his life, when he received a position at court which made it possible for him to marry. The surprising delay of Salieri's wedding until 10 October 1775 seems to have been caused by the distribution of the inheritance of the bride's deceased father. The entry in the marriage records of St. Stephen's Cathedral is quite clear. Both are exempt from three publications of the banns. After having taken an oath of being unmarried they were united on 10 October . There is obviously a comma missing after "alhier" and thus the claim that the groom had been living at the Bischofhaus for ten years cannot be correct. Salieri had not been living in Vienna for this length of time. His wife Eva Maria Theresia Helferstorfer was born on 22 April 1754, first child of Carl Jacob Helferstorfer, an employee of the bank administration of the ministry of finance. Since her mother Catharina, née Timmer was a granddaughter of the regens chori Mathias Timmer (1662-1742), Salieri's wife was a cousin of Mozart's piano student Josepha Auernhammer. 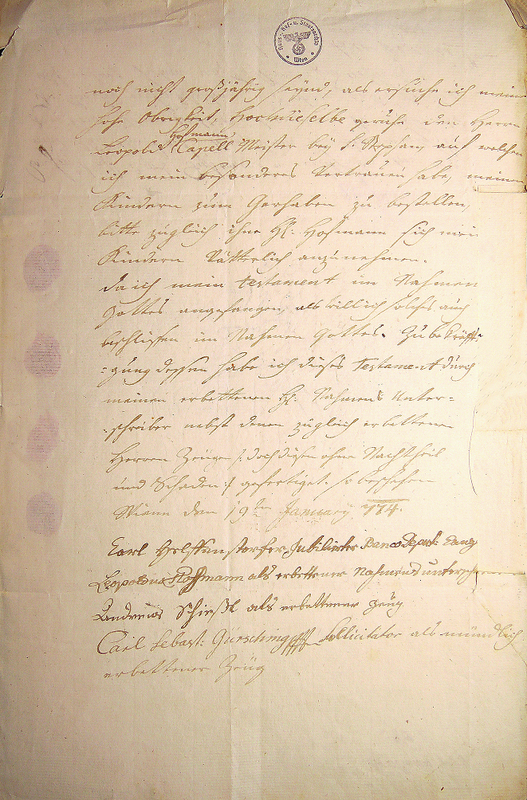 The baptismal entry of Salieri's wife Eva Maria Theresia Helferstorfer (1754-1807). The two godparents from the poorhouse mark the generally close relation of the family to Catholic institutions: Therese's uncle Ignaz Helferstorfer was a librarian at St. Florian Monastery and her younger brother Engelbert was a godson of St. Florian's provost Engelbert Hoffmann. The first two of Salieri's own children also had poor people as godparents (A-Wd, Tom. 80, fol. 289r). Robert Haas actually mentioned the correct date of Salieri's wedding in passing, but since he obviously consulted none of the primary sources himself (those were the days when archivists were willing to oblige to requests submitted by mail or phone), he didn't publish the most reliable source concerning the date of Salieri's wedding, namely the entry in the marriage records of St. Stephen's. That Haas actually saw the original of Salieri's marriage contract must be doubted as well. Not only does his transcription (probably provided by the legendarily incompetent Hanns Jäger-Sunstenau) contain over twenty transcription mistakes (such as "anfahenden" instead of "anhofenden", "als" instead of "oder", "Theodoruns"[!] instead of "Leopoldus" – not to mention the absence of several words), it also comes with the revealingly useless shelfmark "Wiener Rathaus". Haas's article is generally flawed and very superficial. His most fundamental error was that he overlooked the pivotal contradiction between the marriage entry and the marriage contract regarding the date of the wedding. Had he explicitly pointed out this inconsistency, many of the following misunderstandings could have been avoided. There are good reasons to presume that Edward Elmgren Swenson actually examined the original marriage contract, because his transcription avoids a number of Haas's most glaring mistakes and adds a number of new ones. And yet, Swenson overlooked the main clue in Haas's article and therefore was unable to ascertain the correct date of Salieri's wedding. Not surprisingly, Swenson gives no exact shelfmark of the contract. Rudolph Angermüller never tried to check the original of the contract and twice published Haas's transcription with all its mistakes, including the telling location "Wiener Rathaus". Haas's muddled prose even lead Angermüller to believe that Salieri's wife died in Eisenstadt. Angermüller's three-volume collection of Salieri documents disregards the entry concerning the composer's wedding at St. Stephen's Cathedral. Volkmar Braunbehrens lists Haas's article in the bibliography of his Salieri biography, but he obviously never read it, because he also is unaware of Haas's mentioning the correct date. Together with her younger brothers Engelbert and Johann Baptist Helferstorfer, Theresia Salieri owned the house Stadt 1115 (last numbering 1088, today Spiegelgasse 11, replaced with a new building in 1848) which made it possible for Salieri to live in his own house for the rest of his life. His marriage contract obliged his wife to pay him 500 Gulden a year from her rent and interest revenue. 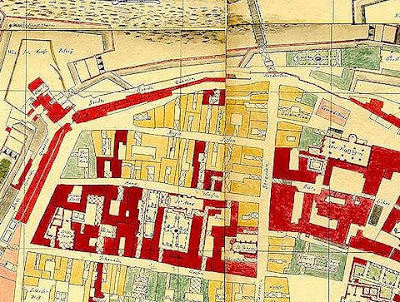 The "Helferstorferisches Haus" Stadt 1115 on Huber's Vogelschauplan. The Graben is in the foreground. 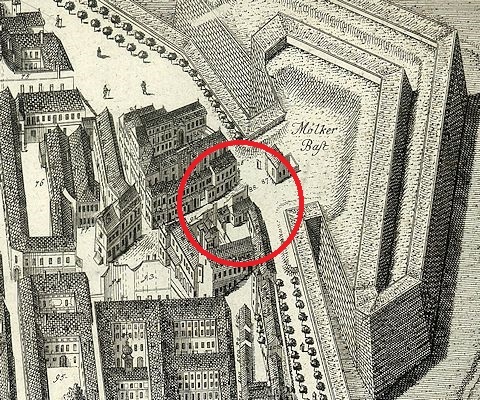 The wealth of the Helferstorfer family was based on two premises: a) the estate of Therese Salieri's great-grandfather, the Italian-born hatter Anton Zerleti (d. 3 July 1694) whose widow Sophie (d. 24 October 1737) bequeathed a house to her three grandsons Carl Brentano Castello, Ignaz Innozenz and Carl Jacob Helferstorfer (son of Georg Marcus Helferstorfer and Catharina, née Zerleti, Salieri's father-in-law); and b) the economic skill of Carl Jacob Helferstorfer who not only bought the shares from the two other heirs in 1752, but in 1763 also managed to acquire the adjoining building in the Göttweihergasse. By 1771 the two old houses had already been replaced by the new building which on 12 November 1774 eventually became the property of Salieri's future wife and her two brothers. After the death of Salieri's wife the house in December 1808 went to Engelbert and Johann Baptist Helferstorfer and "vier Salierische Kinder" (four Salieri children). In 1828 Salieri's eldest daughter Franziska Thrier sold her share to her siblings. In 1837, after the death of Engelbert Helferstorfer in 1822 and the death of Franziska Xaveria Salieri, the house became joint propriety of Johann Baptist Helferstorfer and his nieces Katharina Rumfeld, née Salieri (1788-1849) (a goddaughter of Caterina Cavalieri) and her sister Anna who in 1844 gave her share to her brother-in-law Philipp Rumfeld and his son Eduard. 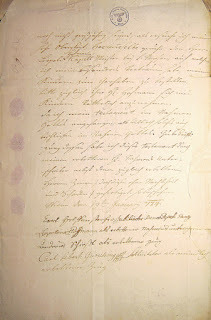 The signatures of Susanne Wagner, Katharina Rumfeld, Anna Salieri, and Philipp Rumfeld (representing his minor son Eduard) on the 1846 contract concerning the sale of the remaining shares of the house Stadt 1088 to Susanne Wagner. 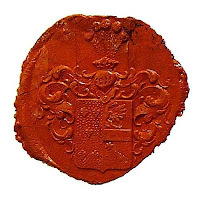 The seal is that of the lawyer Dr. Theobald Rizy. In 1836 Johann Baptist Helferstorfer bequeathed his half of the house to his housekeeper Susanne Huber (1806-1880), whom shortly before his death he had adopted, together with her brother August. 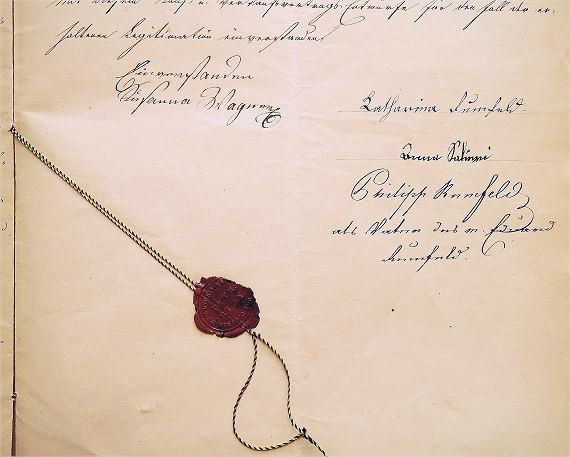 On 25 July 1837 Susanne Huber-Helferstorfer (as she now called herself) married the notary Simon Rudolf Wagner (1800-1846) (St. Augustin, Tom. 11, fol. 13). 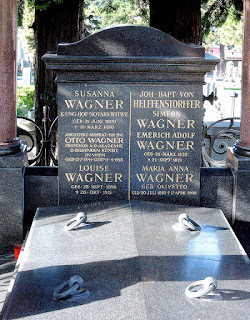 The crypt of Otto Wagner's family in the Hietzinger cemetery where Salieri's brother-in-law Johann Baptist Helferstorfer is buried as well. 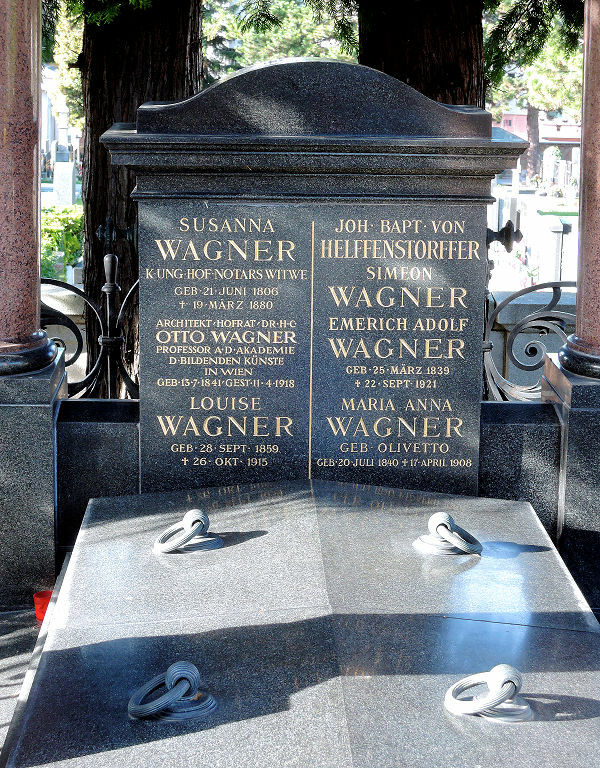 On the headstone he appears with the slightly incorrect name "von Helffenstorfer". Simon Wagner and his wife Susanne, who in 1846 bought the other half of the house from Rumfeld, were the parents of the famous Austrian architect Otto Wagner. Thus Wagner's studies of architecture were basically funded by the estate of Antonio Salieri's relatives. But this is a completely different story. Michael's careful work has cut through another Gordian knot! I don't recommend anything else. I only add a few corrections to the books already written, some of which are very good. 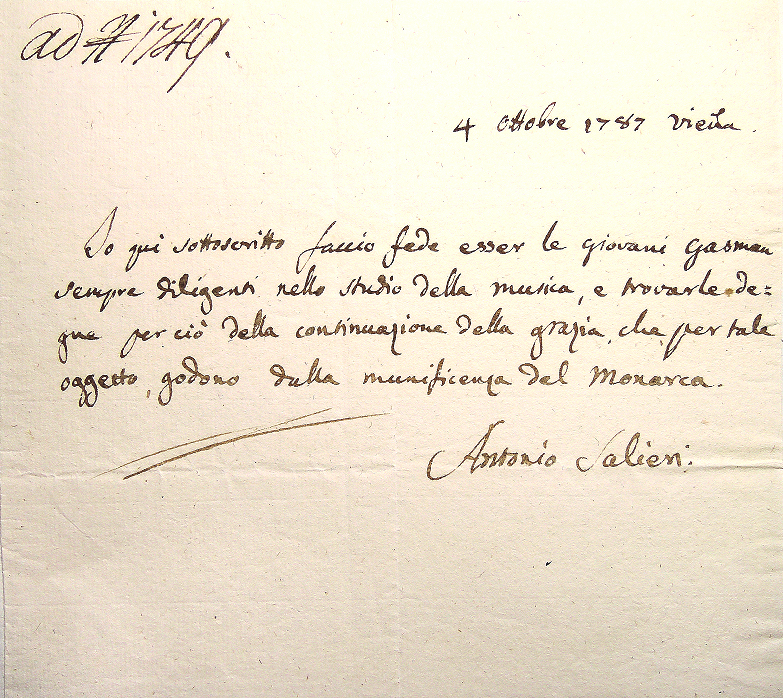 Any idea about Antonio Salieri's library beyond his scores. His inventory at the time of death doesn't list any books, and Da Ponte and others describe him as an avid reader, his libretti show a preference for classic literature, do any period auction catalogs or other sources indicate a personal library. Thanks for the great article above. This is awesome! Thank you for sharing your knowledge! May I ask where did you get the documents pic from? I searched the codes you wrote uder the photos in google but I can't get anything that isn't your blog. I don't understand your question. I don't get my material from the Internet. I put things ON the internet that cannot be found anywhere else. These documents can only be found in archives. You may be interested to learn that about 99,9999999% of the documents that mankind has created cannot be found on the Internet.